A Roman Catholic Diocese in Kentucky said a group of high school students could be expelled after viral video showed them confronting indigenous marchers in Washington D.C. during the inaugural Indigenous Peoples March. 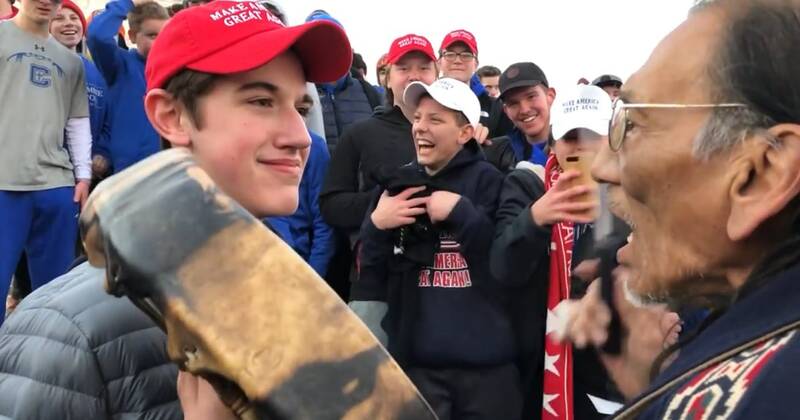 Laura Keener, the communications director with the Roman Catholic Diocese of Covington, said students from Covington Catholic High School could be expelled after video appeared to show them taunting a group of Native American activists including a man identified as Vietnam veteran Nathan Phillips who were singing on the steps of the Lincoln Memorial at the end of the march Friday. Videos over the weekend showed the group of students, most of whom had been attending the annual March for Life, standing on the Lincoln Memorial laughing and chanting at Phillips and a small group of Native Americans. One particular video showed an unidentified student wearing a red “Make America Great Again” hat standing motionless in front of Phillips for several minutes. “We condemn the actions of the Covington Catholic High School students towards Nathan Phillips specifically, and Native Americans in general, Jan. 18, after the March for Life, in Washington, D.C. We extend our deepest apologies to Mr. Phillips. This behavior is opposed to the Church’s teachings on the dignity and respect of the human person,” Keener said. She added the incident is being investigated and students could face punishment, including expulsion, although it wasn’t immediately clear if Covington Catholic staff were with the students and if they could also face discipline.